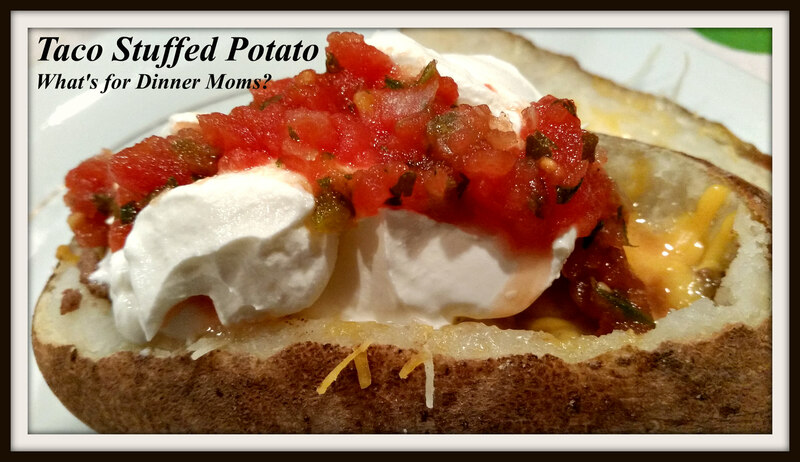 Taco Stuffed Baked Potatoes – What's for Dinner Moms? Yesterday was the start of “The Storm.” It really wasn’t too bad and I was shocked that they cancelled school last night for today. I thought for sure they would wait until morning to see what the weather was like. I love snow days and so happy we have one today. I am thinking lots more cooking and baking again today! Any suggestions for baking? I am not a big baker but that just seems like the thing to do on a snowy day! My family loves potatoes but I get tired of mashed potatoes and roasted potatoes. We needed an easy dinner and I remembered that we recently went to a restaurant when we were visiting Rochester that had all kinds of stuffed potatoes. A whole new list of options has opened up to me for making easy dinners for my family. Our first one to try was Taco Stuffed Potatoes. At first the kids thought it was really strange. They kept asking what else was for dinner. Once they started eating though they thought they were fantastic! I cooked 6 fairly large potatoes and they were gone by the end of the meal. Serve them with a green salad and you have a complete meal. Tip: Don’t discard the insides of those potatoes. Save them to use as a thickener in soup, to make potato pancakes or fried for breakfast! *Also to save time baked your potatoes ahead of time and refrigerate until ready to use. toppings as desired: sour cream, salsa, taco sauce, olives, onions, peppers, black beans, corn, etc…. Rinse potatoes well and cut any bad spots off. Dry potatoes well. Rub oil over potato skin and then sprinkle with sea salt. Place on baking sheet and bake for 1 hour or until fork tender. Remove potatoes from oven and allow to cool a bit. While potatoes are cooking make the ground beef filling. Brown ground beef in medium skillet over medium heat. Break the ground beef into small pieces as it cooks with the side of a spoon. Once meat is fully cooked drain off grease. Return pan to stove top and mix in chili powder, onion powder, garlic powder, crushed red pepper flakes, oregano, paprika, cumin, salt, pepper and water. Allow mixture to come to a boil. Taste and adjust spices to your liking. Boil until water has mostly evaporated. Remove pan from heat. Slice a 1/4″ off the top of each potato. Scoop out a bowl in each potato leaving just 1/4″ or so around the edges. Divide the ground beef among the potatoes and top with a bit of cheese. Place potatoes back on rimmed backing sheet and bake until meat is warmed through and cheese has melted. Remove potatoes from oven and serve with a variety of taco toppings as desired. We had a snow day today too. Called last night. Though it is really bad by us. And is STILL coming down! I am not a big fan of baked potatoes, but these look delicious. I went out this morning for Physical Therapy and at first thought they were crazy for calling a snow day. Then I noticed that NONE of the sidewalks were cleared and most of the kids around here walk so it would have been extremely dangerous. I like snow days so it is a win-win! I am just starting on my baked potato odyssey. I plan on stuffing them with everything from Reubens to soup! Yum! When I was growing up there was a stuffed potato place by my house. I always got the pizza potato. I like your twist! Ooooo, a pizza potato! My kids would love it! I am thinking Reubens and soups too. If it helps any I remember them leaving in some of the potato, fluffing it with a pat of butter (probably margarine back in those days! ), then adding pizza sauce, mozzarella and I think whatever “pizza” toppings you want and then they would melt it all. Tasty memory. I am going to have to try it! Oh my, that makes me hungry! Just in my wheelhouse too!! GREAT idea! They look delicious! This is going on my food list for sure! What a delicious idea! MMM, now why haven’t I ever thought of that? Lol! I thought the same thing! These look really good! Stuffed baked potatoes are so much fun and so versatile. I’d love to have you share this recipe at the Healthy Living Link Party. Thanks! I didn’t read through all the comments but how much snow did you end up getting? They don’t call a snow day here until 5 am the day of school and that’s only if more than a foot or more is predicted. But of course this is the rugged Central Oregon, lol! About 8″. They usually don’t call unless it’s more or icy. When I went out though no sidewalks were shoveled and they were warning against shoveling because it was “heart attack” snow. Super wet and heavy.